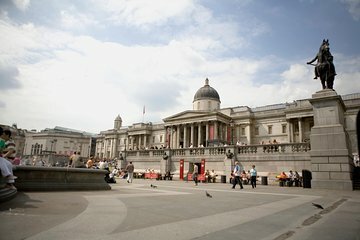 Explore the National Gallery — one of the most visited art museums in the world — on this private, 2.5- to 3-hour tour. With your specialist art historian leading the way, make a beeline for the gallery’s most impressive works. Get up close to Flemish masterpieces by Van Eyck and Rubens, and admire works by Leonardo da Vinci, Michelangelo, and other Italian greats. See, too, French Impressionist and Post-Impressionist paintings by Picasso, Cezanne, and Monet. Along the way, learn about the pieces you see and the artists who painted them. Navigate one of London’s busiest museums with ease, and learn more from your private, art historian guide. Our meeting site kept changing and the guide nor we had a sense of what was happening. Finally called the contact number and given guides cell number. I wish we had just gotten headphones. We knew how the commisioning system worked, but each painting was explained and re explained. We Asked to see highlights, but guide had her favorites and that is what we got. The gallery has its own tours. We got this so we could hear, but English was not 1st, 2nd or 3rd language so understanding was difficult. I would not do this tour again.